True vet dungeon dps build. 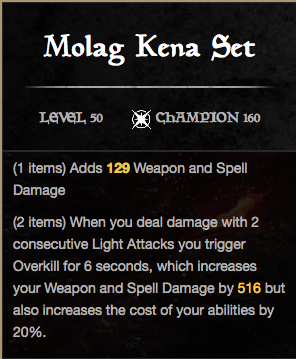 Malog Kena matched with Power Overload makes a DANGEROUS combo! Power Overload bar: Endless Fury, Turn Undead, Bound Aegis, Hardened Ward, Dark Conversion. I shouldn't be sharing this build... it's that good. All other points distribute at will. Is this build still relevant? Yes, like to know if this build is still strong in Clockwork patch? Always luv Sorcerer, using pet build now. Have you done a build for that? It’s still strong, however I have changed the build since posting this… using new sets. – Replaced Netch’s Touch and Molag Kena with Mad Tinkerer and Stormfist. – Skills: Hardened Ward and Crystal Frags is now on the front bar. Streak and Elemental Blockade is now on the back bar. I usually start off on the back bar now so could make it first bar if wanted. I buff up, then drop blockade and streak through it. Then weapon swap while I turn around to drop lightning flood and i just endless fury low health targets, crystal frag procs… done and done. It’s also easier to protect yourself with the new skill bars because you can use hardened ward while in combat and right before you weapon swap back to use dark conversion if you need it. The procs on the new sets are amazing! Especially Mad Tinkerer. It hits hard! Anyway, I like my new set-up alot… it’s alot of fun and works really well. oh… also I swapped out Power Overload for Absorption Field for the heals. It comes in really handy for emergencies. I used it when I was trapped in the cage in White Gold Tower, I wouldn’t have made it out without it. Also good for silencing players in Cyrodiil. What’s your dps looking like? Just out of curiosity. After buffing up with Power Surge it’s at 3.5k and I can reach in excess of 4K when in combat due to Weapon/Spell power enchant on an albeit Legendary weapon. I love this build. Awesome choice in gear. 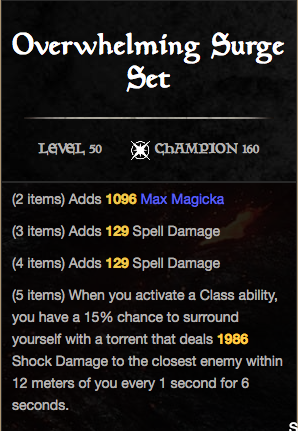 I switched out a couple spells and a different choice for Champ points since i’m Only 375, but still awesome. This is by far the greatest build I’ve ever used. Makes you almost immoral and completely op. Stormfist and Mad Tinker make dps unreal. Did sword and shield on back bar to get complete overwhelming surge set, mad tinker, and stormfist. The stats reflect bonuses from provisions. I believe you can find Tinkerer at Guild Traders regardless of having the Clockwork City DLC. 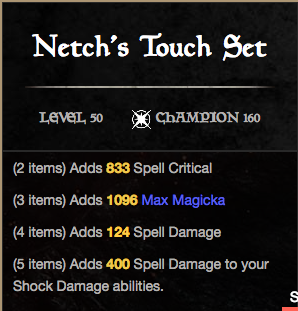 Netch’s Touch is still a valid set for this build if you can’t find Tinkerer… although the latter is preferred and really fun. What is your rotation step by step. Just made my first sorc and I am curious.